On midnight January 31 the deadline for MLS expansion bids passed. This may be (though let’s not forget China) the fastest growing football league worldwide and its commercial potential shows very well. Since MLS has no promotion/relegation connection with NASL and USL, entry is based on economic and infrastructural criteria. Entry fee for MLS used to be at mere $10 million back in 2006, when Toronto FC was joining the league. Now it’s at $150 million and yet there are 12 groups of investors who officially confirmed their bids. Now the 12 candidates will compete for 4 places in the league. Teams 25 and 26 will join in 2020, teams 27 and 28 are to follow by 2022. The first two are likely to be revealed by the end of 2017. So let’s check who’s competing. If you know Charlotte, it’s probably for NFL football, but even more likely for NASCAR. And it’s precisely the company behind NASCAR, Speedway Motorsports, who launched the city’s MLS bid. New MLS stadium could be built in the place of aged American Legion Memorial Stadium at CPCC campus. Just like the historical predecessor, it would have semi-open layout with only a small single tier in the north, while remaining three sides would have 3 tiers. This would create an opening to watch Charlotte’s skyline, creating a nice visual impression by day and night. Initial study for the side was commissioned to HOK and Jenkins Peer Architects, but in the final MLS bid a new study from Manica Architecture was included. The stadium’s budget, expected to reach $175 million, would be financed in half by the club’s ownership and in half by public authorities. The second batch would come from equal contributions by Mecklenburg county (future owner of the stadium) and city of Charlotte. While the county secured their contribution last week, municipal authorities are against such funding. In this case neither the name nor stadium design have been established yet. One thing we know is that preferred location for the soccer development would be the Tennessee Fairgrounds, the city’s primary sports and leisure complex. The bid has full support of Nashville mayor Megan Barry which may prove important in pushing it forward. Indy Eleven are a club that established itself very fast in American soccer. Despite being formed as late as 2013, they managed to draw crowds of just under 10,000 per game while playing in NASL (2nd league). Their bid includes renderings that may seem familiar to you. This same stadium design was proposed back in 2015 and at that time it failed to get public support. Why should it succeed now? 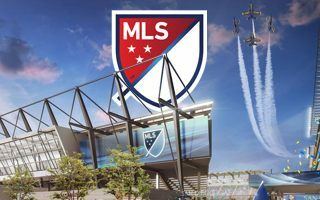 Well, MLS bid is on the table, this makes it all the more worthy, even if construction costs are said to have risen from $82 to over $100 million. No financial framework is in place as of now, but talks are ongoing on how this could be financed. This unique vision of stadium conjoined with skyscrapers and with a public park on top shouldn’t be new to you. We’ve written about it on a couple of occasions. Now it’s at the heart of Detroit’s MLS bid launched by billionaire Dan Gilbert (owner of Cleveland Cavaliers) and Tom Gores (Detroit Pistons). Upcoming weeks will show whether the project has any chance of competing with the rest, because the proposed stadium site is also where a state prison construction is on hold. If authorities decide to go forward with the prison, it’s back to the drawing board for Gores and Gilbert. However, in recent days rumors began surfacing that Gilbert is ready to make an offer on the land soon. Phoenix already has a football team. Formerly known as Arizona United, now Phoenix Rising FC, the side currently plays in USL (3rd league) but have made serious steps to upgrade, recently having signed contract to create their training center and temporary stadium. Now they introduced us to the eventual permanent home’s concept. The best football-specific stadium in Arizona would be created east of Phoenix itself, between Scottsdale and Tempe. Here, beside the Salt River, a vast residential complex is planned and the stadium would be a significant part of it, occupying 45 acres (18 hectares). Phoenix Rising commissioned global practice HOK to deliver their stadium design, resulting in an impressive vision of a weather-proof stadium covered with ETFE cushions. This lightweight solution might go hand in hand with solar batteries, which would be included in the outer skin. Though the stadium would be an enclosed dome technically, it should also create an open-air feeling thanks the use of transparent panels above the central field. Additionally, the north-western corner would create a visual opening, welcoming fans accessing the building. Presented last year, the proposed 20,000-seat stadium beside Union Station is facing a mixed reception. In the proposed model it would require public subsidy of $60 million (out of total cost of $200 million) and this portion of the funding has been widely discussed. While Missouri governor Eric Greitens calls the aid “welfare for millionaires”, reflecting views of a wide portion of the public, just on Monday the St. Louis Board of Aldermen has voted to advance a legal measure that would make the stadium happen. If the $200 million deal passes the full board again later today, it will go to a public vote of city residents in April. The second bid from North Carolina is somewhat more solid than that of Charlotte. Here there already is a team (North Carolina FC) and there is a stadium concept too. Sadly we don’t have access to renderings (should be published soon) but some information has been made available. The planned stadium was designed be renowned Gensler office and will hold 22,000 people. Its cost is expected to reach $150 million and will be financed entirely by the bid’s investor Steve Malik. That said, Malik will ask for public funds for infrastructure around the stadium. According to The News Observer, the stadium should be covered with a transparent dome, somewhat like the US Bank Stadium. It’s a rare case among the 12 bidders where there not only is an existing club but also a modern stadium in place. Of course today Toyota Field only meets 3rd league requirements, but the team already have documentation in place on how to expand it to meet MLS rules. Also, San Antonio’s team has recently rebranded itself from Scorpions to San Antonio FC, making it more appealing to the changing football fanbase across the US. The team from California’s capital is known not only within the US. They made waves soon after being established in 2012 after their home games in the 3rd league had attendances of nearly 20,000. It seems Sacramento Republic don’t have to prove anything to anyone, their fanbase is quite strong. For the time being they play at temporary Bonney Field (and sell out every game!) but the planned 25,000-capacity stadium has been greenlighted in late 2016, making this bid a seemingly strong one. If any, a major issue for it may be the number of other MLS teams in California. They’ve only been around for 1.5 years and already managed to prove their popularity. FC Cincinnati have dominated the USL table in terms of attendance, drawing an average of 17,296 people per game. Currently the team are based at Nippert Stadium, which at the moment is having its field widened for football use. However MLS demand a purpose-built stadium so the only option is finding a proper site, concept and financial structure for the new venue. As of now, there is no specific design for this bid. Rowdies are one of the more established sides in American football, even if they’re playing at a hardly fitting baseball stadium. Still, or even because of that, they also have one of the more stunning new stadium designs, should Al Lang Stadium convert from baseball to football. Their bid also gathered significant support among residents, politicians and celebrities. California is among the most football-crazy states in the US and in San Diego alone roughly 6,000 people regularly pass the southern border to watch Liga MX games in Tijuana. That’s why an ownership group led by FS Investors wants to establish a strong football fanbase here, in partnership with Club Tijuana. The proposed stadium for new MLS franchise in San Diego would stand on the site currently occupied by Qualcomm Stadium in Mission Valley. The grand stadium became obsolete after Chargers had left for Los Angeles in January 2017. The group of investors wants to buy all of the stadium and its surrounding lots, a total of 166 acres (67 hectares) and build a major mixed-use complex worth some $1 billion. A fifth of that price would be consumed by MLS-specific stadium able to hold 30,000 people. The building would have a distinctive layout with horseshoe stands and two pavilions enclosing the south end. The stadium would be financed privately, with half of the funds coming from MLS investors and the other half from San Diego State University. The university’s team Aztecs would become second tenant while up to 800 students would live within the complex. After five years the MLS ownership would transfer their 50% of stadium shares, making the stadium entirely owned by SDSU.